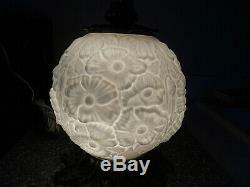 HERE FOR YOUR VIEWING IS A VINTAGE FENTON WHITE MILK GLASS DOUBLE GLOBE GWTW(GONE WITH THE WIND)DESIGN ELECTRIC TABLE LAMP IN THE BEAUTIFUL POPPY PATTERN. 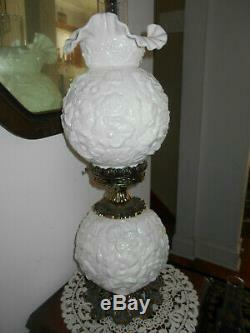 THIS LAMP MEASURES 22 1/2 HIGH TO THE TOP OF THE RUFFLED & CRIMPED SHADE AND APPROX. THIS UNIT HAS A 3-WAY LIGHTINGTOP/BOTTOM/BOTH. ANY BLEMISHES IN THE PICTURES IS STRICTLY FROM THE CAMERA FLASH/LIGHTING. IT IS IN EXCELLENT CONDITION FREE OF ANY CHIPS, CRACKS OR REPAIRS. The item "VTG FENTON White Milk Glass POPPY Double Globe GONE WITH THE WIND Electric Lamp" is in sale since Thursday, April 11, 2019. This item is in the category "Pottery & Glass\Glass\Art Glass\North American\Fenton". The seller is "fuffsfishinghole" and is located in McHenry, Illinois. This item can be shipped to United States.